The Council could be introducing two schemes that will place tighter controls on the standards of some private sector landlords and the behaviour of tenants in neighbourhoods throughout Coventry. The Council has agreed to consult on a Selective Licensing Scheme (SLA) and Additional Licensing of HMOs (AL) which the local authority hopes will help improve the quality of housing and HMOs and the levels of anti-social behaviour in some areas including tackling issues like flytipping. A 10-week consultation is now underway to enable both tenants, private landlords and other stakeholders and community groups to have an input on the way the schemes could operate. Council licensing officers have identified 37 locations (affecting almost 9000 homes) across the city where there could be benefits in running an SLA and have gathered evidence suggesting that AL is required across the whole of the city. The locations all have more than 20 per cent of houses that are privately rented and also have faced problems including anti-social behaviour (which has not been addressed by landlords), low housing demand, poor property conditions, high levels of crime and deprivation. Cllr Ed Ruane, Cabinet Member for Housing and Communities, said that the two schemes would help improve the condition of housing and said that raising the standards of private rented housing would address issues of health and equality whilst also improving the quality of the environment for everyone. He said: “We are in desperate need of more housing and as part of a whole series of steps we are taking we need to also look at the quality of existing housing stock in the city. “We need to ensure that standards of housing is better in the private housing sector, and we have examples from other towns and cities where licensing schemes have worked. “The aim of a property licensing scheme is to improve the way that private landlords maintain their property/ies, and interact with neighbouring properties. It would also help us to monitor the behaviour of tenants both in the way properties are maintained but also issues that affect neighbours. The Housing Act 2004 provides the power to the Council to introduce Selective Licensing and Additional Licensing Schemes in its area. “I’m hoping that we can gain an effective way forward in operating the two proposed licensing schemes. For example under proposals a selective licence will cost around £380 for five years, which equates to £6 per month or £76 per year. Landlords would be issued a licence requiring them to demonstrate appropriate standards are being met – including gas and electrical certification, and maintaining health and safety standards. As well as additional discretionary licensing conditions to address ASB and environmental/management issues. In some cases landlords may not be charged a fee for a licence if they are a ‘not for profit’ charity, or helping the Council meet homelessness duties. Each case would considered on its merits. A 10-week consultation to help in developing a Selective Licensing Scheme and an Additional Licensing Scheme runs from the 9 January to 20 March 2019. 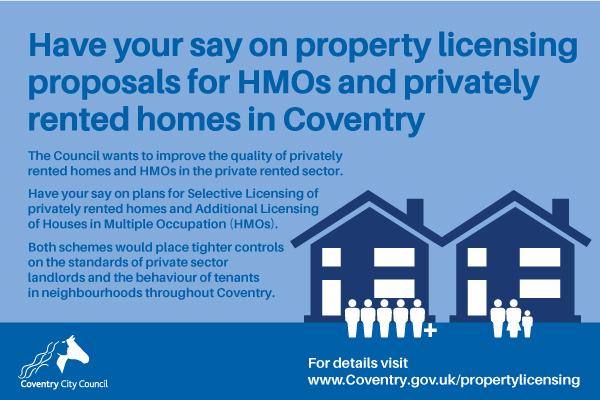 The consultation can be accessed at www.coventry.gov.uk/propertylicensing. Both schemes could take effect and start in 2020 and run for five years.